Gather pastry into a ball. Divide in half. On lightly floured surface, shape each half into flattened round. Wrap in plastic wrap; refrigerate about 45 minutes or until dough is firm and cold, yet pliable. This allows the shortening to become slightly firm, which helps make the baked pastry more flaky. If refrigerated longer, let pastry soften slightly before rolling. Heat oven to 425°F. With floured rolling pin, roll 1 pastry round into round 2 inches larger than upside-down 9-inch glass pie plate. Fold pastry into fourths; place in pie plate. Unfold and ease into plate, pressing firmly against bottom and side. In large bowl, mix sugar, 1/4 cup flour and the cinnamon. Stir in peaches and apples. Spoon into pastry-lined pie plate. Sprinkle with almonds. Cut butter into small pieces; sprinkle over filling. Trim overhanging edge of pastry 1 inch from rim of plate. Roll other pastry round into 10-inch round. Cut round into 1/2-inch strips. Place 6 strips across filling. To make lattice top, weave a cross-strip through center by first folding back every other strip going the other way. Continue weaving lattice, folding back alternate strips before adding each cross-strip, until lattice is complete. Trim ends of strips. Fold trimmed edge of bottom crust over ends of strips, building up a high edge; seal and flute. Cover edge of pastry with 2- to 3-inch strip of foil to prevent excessive browning. Bake 35 to 45 minutes or until crust is brown and filling is bubbly, removing foil for last 15 minutes of baking. Cool on cooling rack. Serve slightly warm. Peaches out of season? Substitute 2 cups frozen sliced peaches, partially thawed and drained, for the fresh peaches. 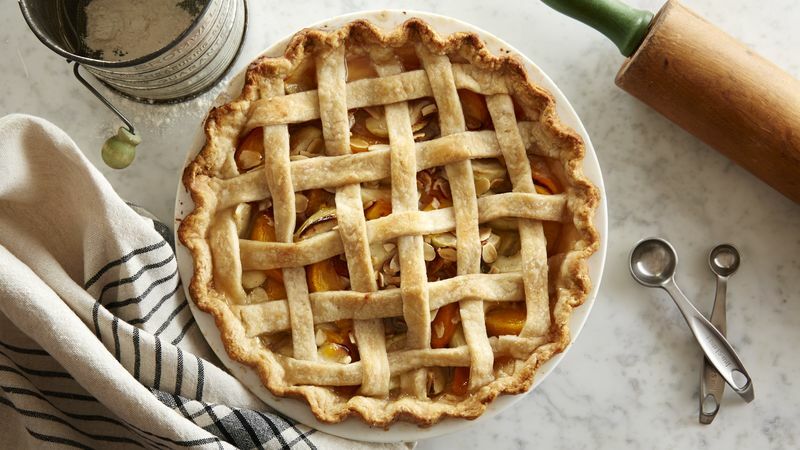 Use a pastry wheel to cut lattice strips with a decorative edge. Use Betty Crocker® pie crust mix for the scratch pie crust in this recipe and save time.